We hate to see food go to waste, so we will share with you some great ways that you can use up a gallon of expiring milk so it never goes to waste again. After reading our ideas, be sure to comment below and let us know your favorite ways to use up a gallon of expiring milk! Do you ever struggle to use up the milk in your fridge? Sometimes we buy milk for a recipe or a weekend brunch, and then it lingers in the fridge, half-used, with the expiration date barreling down upon our guilty heads. It’s a sad waste to pour sour milk down the drain, and we’re here to tell you that you never need to do that again. In this multi-part series, we will discuss several ways to use up leftover milk, from quick and practical projects like homemade mozzarella and yogurt, to treats like homemade strawberry milk and a sweet, smooth liqueur (yes, booze!). Make sure to follow us on Facebook so you don’t miss out on the additional parts of this great series! Prepare the Citric Acid and Rennet: Measure out 1 cup of water. Stir in the citric acid until dissolved. Measure out 1/4 cup of water in a separate bowl. Stir in the rennet until dissolved. Warm the Milk: Pour the milk into the pot. Stir in the citric acid solution. Set the pot over medium-high heat and warm to 90°F, stirring gently. Add the Rennet: Remove the pot from heat and gently stir in the rennet solution. Count to 30. Stop stirring, cover the pot, and let it sit undisturbed for 5 minutes. Cut the Curds: After five minutes, the milk should have set, and it should look and feel like soft silken tofu. If it is still liquidy, re-cover the pot and let it sit for another five minutes. Once the milk has set, cut it into uniform curds: make several parallel cuts vertically through the curds and then several parallel cuts horizontally, creating a grid-like pattern. Make sure your knife reaches all the way to the bottom of the pan. Cook the Curds: Place the pot back on the stove over medium heat and warm the curds to 105°F. Stir slowly as the curds warm, but try not to break them up too much. The curds will eventually clump together and separate more completely from the yellow whey. Remove the Curds from Heat and Stir: Remove the pan from the heat and continue stirring gently for another 5 minutes. Separate the Curds from the Whey: Ladle the curds into a microwave-safe bowl with the slotted spoon. Microwave the Curds: (No microwave? See the Notes section below for directions on making mozzarella without a microwave.) Microwave the curds for one minute. Drain off the whey. Put on your rubber gloves and fold the curds over on themselves a few times. At this point, the curds will still be very loose and cottage-cheese-like. Microwave the Curds to 135°F: Microwave the curds for another 30 seconds and check their internal temperature. If the temperature has reached 135°F, continue with stretching the curds. If not, continue microwaving in 30-second bursts until they reach temperature. The curds need to reach this temperature in order to stretch properly. Stretch and Shape the Mozzarella: Sprinkle the salt over the cheese and squish it with your fingers to incorporate. Using both hands, stretch and fold the curds repeatedly. It will start to tighten, become firm, and take on a glossy sheen. When this happens, you are ready to shape the mozzarella. Make one large ball, two smaller balls, or several bite-sized bocconcini. Try not to over-work the mozzarella. 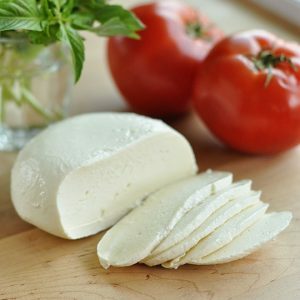 Using and Storing Your Mozzarella: The mozzarella can be used immediately or kept refrigerated for a week. To refrigerate, place the mozzarella in a small container. Mix a teaspoon of salt with a cup of cool whey and pour this over the mozzarella. Cover and refrigerate.